UAMS Professor Charles O'Brien, Ph.D., has been awarded $11.3 million from the NIH to establish the Center for Musculoskeletal Research, which includes, (front row, from left) junior researcher Elena Ambrogini, M.D., Ph.D.; junior researcher Sri Iyer, Jinhu Xiong, M.D., Ph.D.; junior researcher Niels Weinhold, Ph.D.; and (back row, from left) O’Brien; business administrator Mark Mosby; endocrinology Associate Professor and center Associate Director Maria Almeida, Ph.D.; biomedical informatics Associate Professor Intawat Nookaew, Ph.D.; physiology and biophysics Associate Professor Roy Morello, Ph.D.
March 15, 2018 | March 15, 2018 | University of Arkansas for Medical Sciences (UAMS) Professor Charles O’Brien, Ph.D., has been awarded $11.3 million in federal funds over 5 years to launch the Center For Musculoskeletal Disease Research. The Centers of Biomedical Research Excellence (COBRE) grant comes from the National Institute of General Medical Sciences branch of the National Institutes of Health (NIH). The program aims to create multidisciplinary, collaborative and synergistic research centers in states with lower rates of federal research funding. The $11.3 million represents Phase 1 of the COBRE grant in direct and indirect costs. It will support the research of four UAMS faculty who are early in their careers and have yet to secure independent research funding. With approval, COBRE grants can be renewed for up to three phases – representing up to $30 million in funding and support for numerous junior investigators. Each COBRE center is organized around a theme, in this case, musculoskeletal disease. Although the participants in Phase I of O’Brien’s COBRE come from different disciplines, they are all interested in bone health. Elena Ambrogini, M.D., Ph.D., of the Department of Internal Medicine-Endocrinology, is studying the association between atherosclerosis and osteoporosis and a therapy that could target both diseases; Jinhu Xiong, M.D., Ph.D., of the Department of Orthopaedic Surgery, is studying the mechanics behind how exercise improves bone health; Niels Weinhold, Ph.D., of the Myeloma Institute, is studying why some forms of myeloma (cancer that develops in the bone marrow) are more aggressive than others; and Srividhya Iyer, Ph.D., of the Department of Orthopaedic Surgery, is studying how different cellular stress pathways are important for issues like low bone mass. Support for the investigators comes in many forms. They receive funding for their research. They are supported by existing technology at UAMS and the grant can fund additional technology purchases, if needed. 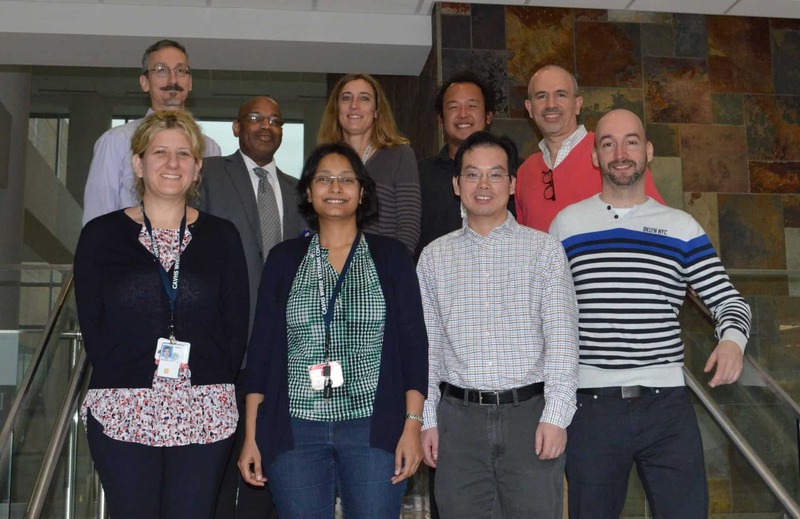 They are exposed to mentoring and networking opportunities in several ways: from senior UAMS faculty, from each other during periodic workgroup sessions, and from distinguished outside speakers invited to UAMS on a regular basis. They also receive detailed help applying for their own research funding. Once they secure a certain level of funding – an NIH Research Project Grant (R01) or similar level – they are considered “graduated” from the COBRE and their spot is opened to make room for another junior researcher. Ambrogini, one of the junior faculty benefitting from the grant, said she could not have dreamed of a better scenario. Support for research at UAMS, specifically among leadership of the College of Medicine. The Center for Osteoporosis and Metabolic Bone Diseases at UAMS, led by Stavros Manolagas, M.D., Ph.D. It is one of the largest and longest-funded osteoporosis research centers in the world and is based in the Endocrinology Division. “Dr. Manolagas led a Program Project grant for 20 years, which really allowed us to develop true synergy within the Endocrinology Division. We’ve seen the success that consistent funding can bring, so we want to build on that success and take the lessons we’ve learned in the division and share them with others,” O’Brien said. COBRE grants are only available for Institutional Development Award (IDeA) states where NIH funding has been historically low. They include 23 states and Puerto Rico.